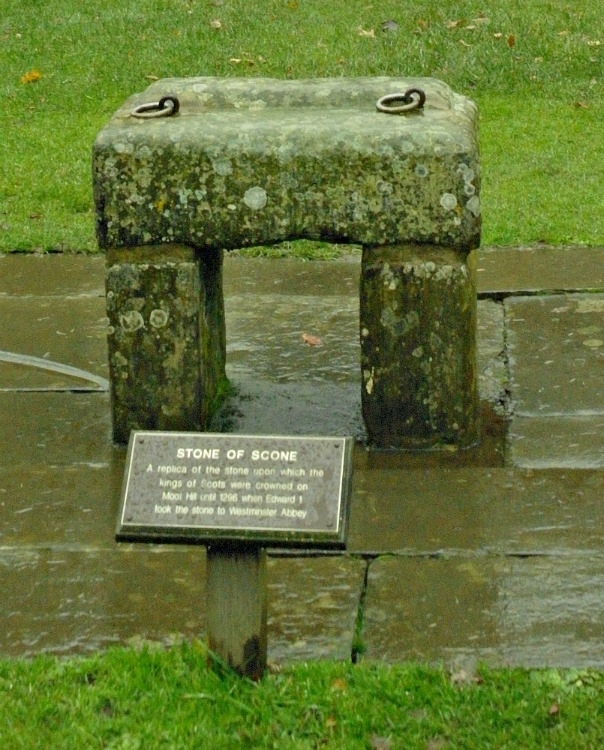 The Stone of Destiny or Stone of Scone is in Edinburgh. Or is that stone a copy of another copy of a replica? What happened to the real stone anyway, the one originally used in Scottish monarchs' crowning ceremonies? We tell all here. And what's so special about a rough block of Perthshire sandstone anyway? The Stone of Destiny is another name for the stone on which the monarchs of Scotland were crowned at Scone, just outside the city of Perth, Scotland. To some Scots it is an icon and a potent symbol. Others wonder at the fuss about an obviously faked chunk of sandstone from Perthshire. In legend, it was the biblical Jacob’s pillow. It was taken to Scythia, by Scota. She was the daughter of a Pharoah. No, really. She married and her descendants became Kings of Spain. One of them carried the stone to Ireland then an early king of Scotland took it over to Argyll. Stone of Scone lookalike, at Scone. (Pictured here) A replica of the Stone of Destiny, apparently. 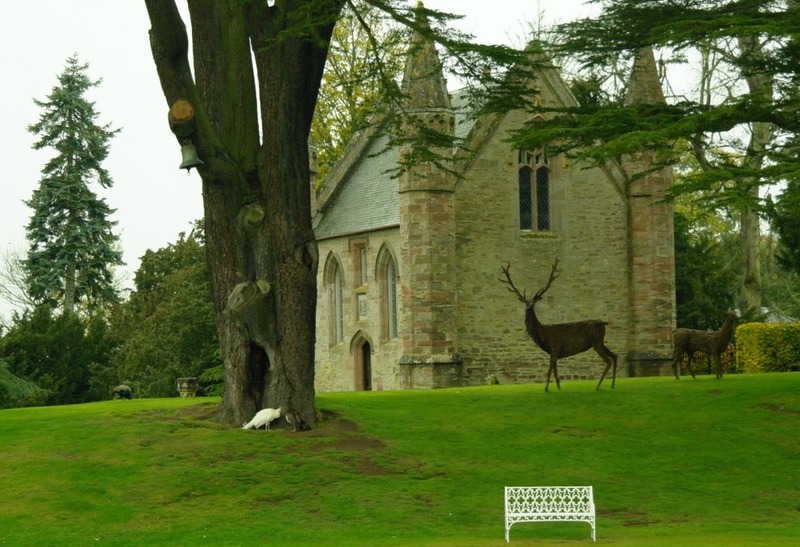 It’s in the grounds of Scone Palace. Gasp! Help ma boab! (And other expressions signifying Scottish incredulity.) News has arrived for the monks at the Abbey at Scone, custodians of the Stone of Destiny. King Edward of (gasp again!) England is on his way! The monks know that this (probably ornately carved) stone is important and has already been graced by the solemn rear-ends of a line of Scottish kings. But by 1296, King Edward of England has had enough of the uppity Scots and wants to crush them forever. Or, worse still, make them like the English. And so they did. By good luck, a local builder was in fitting a new kitchen in the refectory at the time. Aha, building material at hand. No time to lose. The monks did a swap. They took a chunk of the local sandstone, a bit rough and ready, and somehow convinced King Edward of England’s courier that it was (snigger!) the real Stone of Destiny. He said something like: ‘Rai-eet-ow, mite. Stown of Destiny, aa-eeh? Give us an ‘and wiv it. Naa-oo, soign ‘ere on the dotted loin. Anyway, he heaved it into his van and took it to Westminster, London, England. Everyone was happy. The two monks did a high five, or ‘altus quintus’ as they called it in Latin. Nobody minded that the dimensions of the stone were a bit odd for sitting on. There were no carvings, nor carrying hooks, nor any of the details seen in the 12th-century seals of the Scottish kings and also illustrated in contemporary coinage. Something else was done that day in 1296. The monks not only substituted a stone – they had to hide the real stone, of course. A potent symbol of Scotland in a top secret hiding place – so top secret that, known only to a few, the Stone of Destiny was lost. Forgotten. Fast forward. (The nation of Scotland meanwhile got sold off by the hard-up aristocracy and had been in a union with England since 1707.) But here is the interesting bit. A real ‘what if’…….now listen up. In 1818, a certain Mr Nairne of Dunsinane House, near Scone, followed up on a story he had heard from two local men. Some years before, when just young boys working on a local farm, they said that they went exploring a recent landslip on Dunsinane Hill, around the site of an ancient hill fort, known as Macbeth’s Castle. They found a fissure – a hidden cave. Inside it was a black stone, mysteriously carved. Nairne was interested, assembled a team of diggers and investigated. Their diggings eventually revealed this location once again. They found not just the stone as described by the farm lads but also two round tablets with insignia – similar perhaps to the plaque-like objects seen illustrated in the Great Seals of Kings Malcolm V, Alexander I and David I. Well, you’d expect that wouldn’t you? The Scots couldn’t be trusted to draw the right conclusions perhaps, especially as a backward northern province of ‘North Britain’. Oddly enough, that stone has not been seen since. Apparently it was not only black but semi-metallic in appearance, as if it was meteoric in origin. It is known that this type of 'heaven-sent' rock has significance for ancient peoples all over the world. (Pictured here) The Moot Hill in the grounds of Scone Palace, where the Kings of Scotland were crowned sitting on the Stone of Destiny. A replica stone is on the site today, though it isn’t that small shapeless lump on the grass on the left of the picture. No, that’s a peacock, hunched and miserable (as were we) because it was raining. 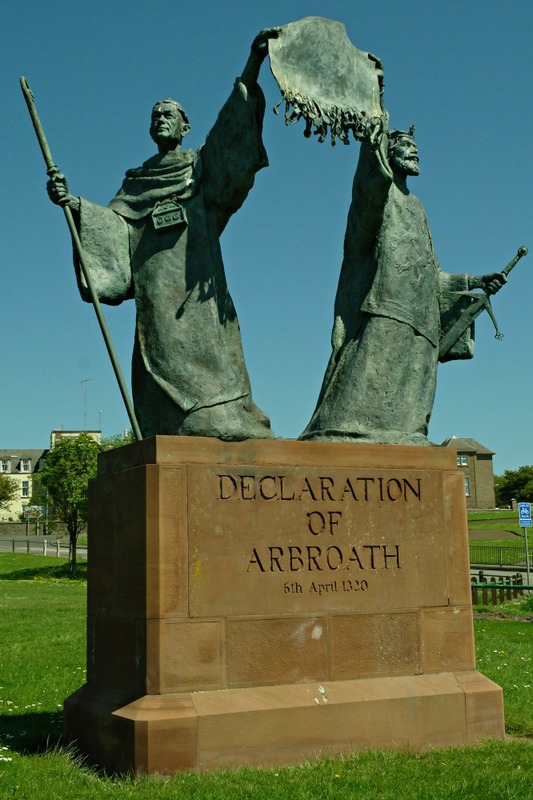 ‘Declaration of Arbroath’ statue, Arbroath. Later still, the so-called Stone of Destiny or Coronation Stone, that lived under the throne in Westminster Abbey, London, England, was damaged by suffragette attack in 1914. Then, in 1950 it was removed by a group of four Scottish students – nationalistically motivated, the rascals! It broke in two. Tee-hee. It was subsequently repaired and left in Arbroath Abbey, which, of course, is associated with the Scots’ ‘Letter of Arbroath’ or ‘Declaration of Arbroath’ (1320), justifying their right to be a free nation. The real Stone of Destiny? Back in 1950, rumours circulated that copies of the stone had been made – but in any case a stone or the stone was returned to Westminster Abbey. Probably it was a case of 'Oh, give them their stone back. That'll shut them up'. Anyway, it wasn’t enough to settle anything down in Scottish politics. The current deal is that the Stone of Destiny, Stone of Scone, Coronation Stone, or whatever it is called, goes back to Westminster if needed for a coronation. Whatever. Right now, you can see a stone of some kind of destiny in Edinburgh Castle. And you can decide for yourself which stone it is. But aren’t legends and enduring mysteries such fun? If you want to read a whole lot more detail about this, then get yourself a copy of The Scots Magazine of December 1984. In there you will find a fascinating and authoritative article by the historian A.C McKerracher all about the mystery of the stone. Real Scottish history started after the Picts, Scots, Britons, Vikings, Angles sorted themselves out. Then King David I created burghs - he needed money. Kings of Scotland - wanted: individuals keen on Divine Rights. The early Kings of Scotland didn’t die in their beds often. It wasn’t a job with secure prospects, as Macbeth soon realised. Standing next to exploding cannons, plus encounters with sharp pointy things and marrying English spouses. Bad ideas, all of them. Here’s a list of Scotland’s monarchs. Our Scottish Accent should hold no fears! Of course you'll understand a Scottish accent when you're here, because we're a friendly lot. Besides, we mostly use our own language only when talking to fellow Scots. (So dinna fash yersel.) We'll make a special effort! Often, how we sound isn't because of Gaelic - that's a different language entirely!